Good morning! 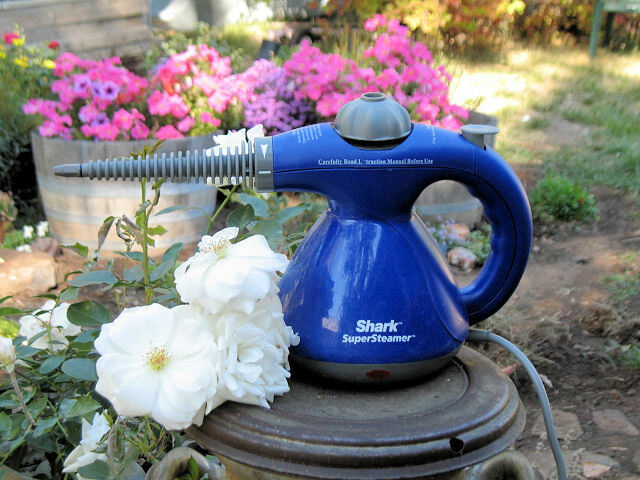 Today I wanted to share with you one of my very favorite pieces of cleaning equipment, the steamer. Mine happens to be a used Shark Supersteamer I bought off ebay a couple of months ago. This thing is the best cleaning investment ever in my opinion. It is fabulous for cleaning windows — just fill with water and let it heat up and start cleaning. Just depress the trigger and lay on some steam with a sweeping motion. Next, use a microfiber cloth in a circular motion and wipe down the steamed area, working your way from top to bottom and ending up with squeaky clean windows. NO CLEANING PRODUCT NEEDED! How easy and environmentally proper is that? This little beauty is also good for stains on carpet (but watch for colorfastness), cleaning grime and gunk from around kitchen and bathroom faucets, the outside of your appliances, you name it. I have antique metal kitchen cabinets and they get steamed pretty regularly as does my counter tops. As long as the object you want to clean can take water, it probably can take steam. Not promising anything here, so use some common sense. I am still in the throes of love-at-first-use and have many other things I want to try cleaning with this little wonder, including the rims on my bike and car. I will keep you posted.